The beauty of the best patio umbrella is that it’s large yet easy to assemble. Just like the Abba Patio 9 Ft Patio Umbrella. The product has a top quality design made of materials that are fade resistant. So you can expect it to endure rain storms and hot weather conditions. What’s more is that the 9-feet size offers optimal shade suitable for a table with four to six chairs. Also, the pole provides support and push button makes opening/closing easier. It’s everything you could have asked for! 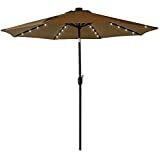 In terms of more advanced features, it’s the Le Papillon 10-ft Hanging Patio Umbrella that ranks as our step-up pick. It’s an offset hanging model that has the ability to shade large areas and tables. The canopy has a mildew and fade resistant design for better performance and durability. And you can slide it easily to get access to more shading angles. So the Le Papillon creation is well equipped for both home and commercial applications. 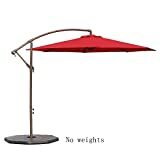 But for budget-friendly consumers, I would like to offer the Best Choice Products 9’ Patio Umbrella. This one comes with all essential features for an improved user experience. Like the excellent crank-and-tilt system, which provides the much-needed sun blockage. Even the polyester fabric does a great job at that. Everything about the product, from the pole and ribbed construction to the overall dimensions, is responsible for the success story. Despite the affordable price tag! Why do you need a patio umbrella? Most people also refer it to as a porch sunshade that is used in a backyard. They make outdoor seating more personalized and comfortable, especially during the summer months. 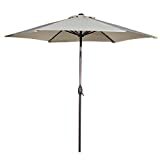 In fact, buying a best patio umbrella for outdoor lounging is the less costly than investing in a good a dining table or furniture. You can find the right size for an umbrella, which doubles as a table shade. A shade this flexible and sturdy offers is not only good for summer, but also during monsoon. You can still spend some quality time outdoors during the monsoon and not get drenched in your backyard. 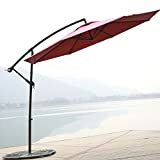 You will find all kinds of patio umbrellas; some designed specifically for protecting against sun rays, some with a subtle auto-tilt feature for lounging, and some with solar LED lights for night use. The average height of a porch umbrella is 9 feet, which is the perfect size for a couple of lounge chairs and a table. Plus, with the right kind of table with a built-in stand, buying the next best furniture should be no problem to you. There are all kinds of furniture for all seasons. For example, you can buy the best patio heater, at a valuable price, for colder months. While an umbrella works for summer and monsoon months. There’s much for everybody to look forward to with the right price and features. While the phrase, “what you see is what you get,” truly does apply in this case, there are plenty of other factors that also play a major role in deciding a good product. And they are as follows. Size: The best way to measure a sunshade for its perfect size is by its height and diameter. This decides how well a shade fits in your backyard without taking up more space than you intended. While this is important to consider, what’s also vital is to measure your table size. According to research, any sunshade should be 5-feet larger than the spot it is destined to shade. Sounds simple enough? The average 6-feet umbrella is able to cover up at least 2 lounge chairs and a table that’s at least 30-inches wide in diameter. Build: The frame material of a best patio umbrella is what separates it from the rest. Generally speaking, a good frame material for such a product is either aluminum or wood. However, recent advances have proved that aluminum sunshade are much sturdier and safer than wooden shades. This is because these frames are easier to clean and maintain, in the long run. If you’ve noticed basic sunshade poles, they’re all made up of aluminum; making it the most effective and valuable frame materials to buy. Other common frame materials include fiberglass and metal. If manufactured correctly, fiberglass and metal frames can resist all kinds of weather and general wear and tear including dust, rust, and other environmental pollutants. Types: Based on the shape, size, and build of an sunshade can you distinguish its ideal type. There are common tilting, Cantilever, free-standing, residential, and market umbrellas. You need to know the various types to avoid investing in the wrong one for your yard. That said, here’s a simple run-down of each type. This type of shade comes with a pole attached not to the center of the umbrella, but at the side. So the shade hangs over the table, without a pole in the center getting in the way. This type of shade is the most common with a pole aligned to the middle of the umbrella. It is available in a variety of sizes with a standard pop-up mechanism. These are the most common types of umbrellas. Designed with a secure base and a simple pop-up sunshade, this kind is generally attached to a table. These are the upgraded version of the residential type. Market shades are usually made up of wood or aluminum frame materials. Plus, they are also famous for their octagonal shape. Tilt: Many modern patio sunshade come with a simple tilt feature. Not all patio sunshade are good for providing shade directly from the top. As the sun descends across the sky, a tilt feature can offer shade from a variety of angles. That said, there are 3 main methods of tilting in a porch sunshade. They are crank, push-button, and collar tilt. Crank tilt is when you simply open the shade and tilt it toward the angle of your choice. This is the easiest way to adjust the tilt setting on an umbrella. The push-button tilt is when you press a button and adjust the tilt angle, by hand. This may be more affordable than crank tilt, but it’s definitely much harder. Lastly, collar tilt is when you twist the collar frame of the umbrella to adjust its angle. This is the second easiest tilting option for most people because you can do this without getting up from your lounge chair. This best patio umbrella is by Abba Patio, which means high quality design and construction. And the powder coated, rust-free steel ribs and aluminum pole are proof of that. Along with the product’s ability to withstand extreme weather conditions, like rain storms and hot weather! But what’s even more compelling is the water repellent, fade resistant polyester fabric. This particular material provides the best UV protection you need. Furthermore, the vented canopy facilitates tons of airflow and prevents inversion when it’s windy. On top of that, using Abba Patio products is a simple task. Thanks to the push-button feature that complements the tilt-and-crank mechanism for opening and closing. So this is the best pick for easy usability. On the other hand, you might not appreciate the location and performance of the tilt button. It’s installed too high on that pole and has a very stiff quality to it. Due to the latter, it tends to get stuck when making adjustments. So unless you’re a short person with low tolerance level for such negligible issues, you have nothing else to worry about. 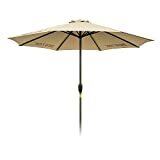 The Le Papillon 10-ft Hanging Patio Umbrella is a model that offers the greatest sun protection. And you have nothing but the large size of the product to hold responsible for that. This particular option is one step ahead in design. The canopy provides excellent mildew and fade resistant properties. Plus, you can angle it however you like to block out those harmful UV rays. Also allow me to bring to your attention the durable hanging pole structure. Even the frame and ribs share the same heavy-duty, powder coated, rust-free design as the pole. As for usability, you have the crank and cantilever opening mechanism to take care of that department. The manufacturer has even added an air vent for heat and wind to circulate. So now you know what to expect from our step-up pick. Patio sunshades by Best Choice Products are both high performing and affordable. 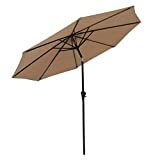 And the Best Choice Products 9’ Patio Umbrella is no different. It is crafted to provide sun protection to multiple people at once. The thing includes remarkable features like the crank-and-tilt system and wind vents. The former, in particular, allows you to adjust the angle and height easily. For a budget-friendly option, it has a lot to offer. For one, the diameter is more than enough to shade areas or tables 48-50 inches wide. Then comes the crank-and-tilt feature, which makes room for maximum, easy angle and height adjustments. Next in line is the best combination of UV resistant material and tough aluminum pole. Even something as small as the wind vent contributes to adding superior comfort. So no more worrying about performance and design just because the product is cheaper, price-wise. Let me begin by stating that the Balichun Outdoor Patio Umbrella has a praiseworthy polyester fabric design. Apart from being fade resistant, the material also prevents light rain. But most importantly, it allows you to sit in your backyard comfortably even in the scorching heat of summer. You’ll also appreciate the best ventilated cover and push button feature.The latter simplifies the task of opening and closing the shade. And what about the pole design? This particular component is rust-free and powder coated. So it lasts for a long time and feels smooth in your hands when making adjustments. In all, the Balichun invention is suitable for the hottest summers. And you can use it for home and commercial purposes. If you want to light up your outdoor space, look no further than the Best Choice Products LED Umbrella. This solar model has a high quality structure. One that you can rely on for many years! So what else is remarkable apart from the best 24 integrated LED lights? The second-most attractive feature comes in the form of the detachable crank handle and pole. This enables hassle-free storage and setup. You can bring additional UV protection into the mix by using the easy-tilt mechanism. Without worrying about heat as the wind vents, which are dual-purpose FYI, cool the air below the sunshade. So expect no disappointments from this best performing pick as far as performance goes. Cantilever models are quite popular on the current market. And one phenomenal pick is the C-Hopetree Cantilever Patio Umbrella. The product features a design built using high density, UV-stabilized polyethylene materials. Such a composition does an excellent job at blocking UV rays while also generating cool breeze underneath. Another best inclusion is the tough powder coated aluminum frame. It brings more sun protection into play. As for the opening mechanism, there’s the exceptional crank/cantilever lift system. It allows you to use the canopy without making much of an effort. So all the best and most important aspects are pretty much covered. You won’t find any option as waterproof and durable as the BESTEK 9ft Outdoor Patio Umbrella. The polyester fabric is not only waterproof but UV and fade resistant too. But here’s the most striking feature. The eight irons ribs the product is equipped with offer extra support while also holding the shape. This guarantees maximum durability, doesn’t it? For stability, the manufacturer has added wind vents. So the heat can escape as much as is required. On top of that, the diameter is more than enough to provide shade for a table set with four to six chairs. So BESTEK does produce the best products that appeal to most consumers. 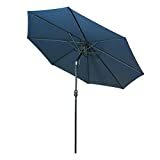 What is it that makes the Blissun Aluminum Manual Patio Umbrella suitable for wind gusts? Without the shadow of a doubt, it’s the presence of the eight aluminum ribs. These tough components add remarkable strength like no other. How about the construction of the equipment? You won’t be disappointed in that department either given the durable, UV resistant, waterproof design. Another characteristic you might value the most is the generous diameter supplied for sun protection. Overall, it’s the combination of sufficient shelter, durability, and easy operation that speaks volumes in this case. The COBANA Patio Table Market Umbrella is an option that can withstand most elements of nature. The product is not prone to rust, peeling, chipping, and corrosion. That’s because the aluminum pole as well as the ribs have a rust resistant, powder coated structure for more strength. If that wasn’t enough, the manufacturer has also installed an excellent vented canopy. It facilitates airflow and makes the product suitable for windy climates. As a consumer, you might also find the tilt-and-crank mechanism to be very useful. The element makes way for maximum angle adjustments. So for reliable protection against harsh weather, you know what to buy. Let me begin by stating that the Giantex 9ft Patio Umbrella offers all-in-one type of protection. That means it provides shelter from sun, rain, and extreme weather conditions. What’s even better is the large size of the shade. Also, note that the product is as sturdy as expected. So it’s an ideal pick for outdoor environments. And let’s not forget the easy usability. Thanks to the tilt-and-crank component that makes closing and opening an effortless task. For durability, Giantex has manufactured using high-quality polyester and steel. So worrying about the patio umbrella being torn down due to heavy winds is not a concern at all. For commercial purposes, why wouldn’t you want to buy an option that provides protection and light? 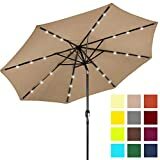 In that case, here’s the Sundale Outdoor Solar LED Patio Umbrella. Yes, it’s solar powered, which is a huge plus point! Moving on, you should know that it consists of 4 integrated LED lights. Another noteworthy addition is the use of solution-dyed, fade resistant polyester. The fabric also offers UV resistant properties. As for performance, the product can withstand mildew and water. And the push-button feature is what keeps the sun rays behind your back. Then there’s the wind vent responsible for keeping the thing intact despite windy conditions. In simple words, the current pick contains many outstanding features that don’t let you down in any way. I’ve put in plenty number of hours into shortlisting not only the highest ranking but also the top performing products. The current retail market is flooded with a sea of options. So what is it that makes these best 10 picks better than the rest? Well, to be honest, it’s the easy usability and affordability of the models. The best patio umbrella is one that provides necessary shade to beat the summer heat. It helps in preventing sunburn as well as other damages caused by UV rays. And that’s the kind of protection you’re looking at with these options. Plus, most of them are waterproof and able to withstand extreme winds. So you can use them in all types of weather conditions. Q. Does a patio umbrella have any proven health benefits? A. According to a study, these act as good shields from UV damage and rain. This is especially good for people who spend a long time outdoors or wish to spend some quality time in your yard. Even though sunscreen is a good solution for sun protection, studies suggest that a sunshade can restrict at least 3-quarters of UV light, and even more, during the summer months. So to answer your simple question, yes, a sunshade has proven health benefits for humans. Hence proving that a best porch sunshade is necessary for anyone spending a good amount of time outdoors. Q. What more can be said about the different frames for patio umbrellas? A. As mentioned earlier, there are 3 main types of frame materials for a sunshade. Starting from aluminum, which is the most reliable, to wood, which is the most expensive, and fiberglass, which is the most lightweight and affordable. Choosing either one of the 3 is not only a matter of personal preference, but also of price, convenience, and maintenance. Aluminum, being the most popular and standard frame material for pole, is also common for these products. It is characterized by its light weight, durability, and sophisticatedly polished appearance. This metal is my favorite from the lot because it’s affordable with high-quality properties. Such as it is resistant to corrosion, dust, and moisture. Seeing that it’s the most economical choice for residential furniture, you can choose any type of aluminum sunshade you want. That is, in a variety of mechanisms for opening, closing, and tilting features. A wood frame is not only the most expensive frame material for a patio sunshade, it is also the most sophisticated investment. If you’re looking to buy into appearance, opting for a wooden shade is ideal. That said, you can opt for the kind of wooden frames that are heat-treated, non-corrosive, and durable. They might not be as durable as aluminum or fiberglass, but they can be treated well enough to resist a little bit of rain and other weathers. However, keeping a wooden frame outdoors for too long means extended exposure to sunlight, moisture, dust, colder temperatures, and rain. So if you have an adjustable or foldable porch sunshade that you can open and close manually, go for this choice. When a patio sunshade is made up of fiberglass, it is perhaps one of the most durable and lightweight frame. Fiberglass is common for its tough exterior which is able to withstand all kinds of wind and weather. Additionally, because its nature, it can also withstand heavy winds and fight corrosion. So if you’re looking to invest in quality and longevity, go for this choice. Q. Is size that important for a patio umbrella? A. Now that you’ve understood the basic mechanics of this best product, you need to know more about measuring its ideal size. Nothing is more important than determining the right size of a shade because if done incorrectly, you might have to replace or return your latest purchase. The top 2 factors to take into consideration for size is the diameter of your table and the weight of your sunshade base. These two factors can easily determine the ideal sunshade size for your backyard. The following chart summarizes the best patio umbrella you can buy based on your current table’s size (measured in diameter). Another significant factor is the base. And the best way to measure this equipment is by its ideal weight based on the table and shade diameter size. The following chart summarizes the best porch sunshade base you can buy based on the shade’s diameter. You must be able to take accurate measurements of the table and base to find the perfect fit. This will exactly what we did to ensure the height and diameter of all the best patio umbrellas. Buying a shade too small will result in insufficient coverage of your porch furniture. On the other hand, an extra-large size might put too much pressure on your table; causing it to topple over if left unsupported. One thing to keep in mind when choosing the right size is that the sunshade must extend at least 5-feet beyond the edge of your table and other furniture. And the bigger the sunshade, the higher the price. Q. Which is the best canopy fabric for a patio umbrella? A. Look for a UV-resistant fabric in different prints and colors. If you’ve never heard of Sunbrella, which is the epitome of durable, outdoor materials, you’re in for a treat! Sunbrella is a synthetic acrylic material and uses only UV-resistant fabrics for complete outdoor protection. That said, it resists all weather conditions, is non-corrosive, and blocks UV radiation effectively. It also doesn’t lose its color or shape in the sun. Other common types of canopy fabrics are acrylic, polyester, and olefin. Olefin is a good alternative to acrylic. It’s water-resistant, mildew-resistant, and UV-resistant. The fabric is made up of polyester, which in itself is a good fabric choice for the best patio umbrella. Along with the common types of canopy fabrics, you can take into consideration the material quality such as its thickness, color-fading levels, and water resistance. Also, are they easy to clean and maintain for the long run? Q. What’s the difference between a market and patio umbrella? A. 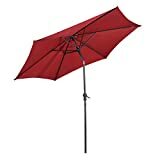 When searching for the best products, we found the term “market umbrella” which is a common type of sunshade too many times. This got us researching about the noticeable difference between a market and porch sunshade. So if you’re still confused about the two types, here’s a simple run-down for you. The best market sunshade is one which is specifically designed to sit under harsh sun rays. The shape of the canopy is commonly octagonal with a sturdy base attached at the bottom for extra support. They are used in outdoor seating arrangements in restaurants and in events and weddings. Commercial spaces often house market shades including food vendors, markets, farm stands, etc. These products are used to protect foods and items from UV radiation. Plus, they’re big enough to accommodate 2-3 adults for an inviting and sun-protected atmosphere. The common fabric types for a market sunshade are acrylic material. It offers incredible protection against moisture, heavy winds, and the sun. On the other hand, a strong metal or wooden frame material supports the weight of a durable canopy material. As the name suggests, a patio sunshade is designed for your backyard. It is made in such a way that it fits through a hole in your porch table. Generally, coupled with a few lounging chairs. A typical patio sunshade design consists of a rectangular or circular or square canopy shape. The shafts are made up of a lighter material, yet highly durable and weather-resistant. The fabric material of an average porch sunshade is Sunbrella fabrics, acrylic, and polyester. Based on modern practices, there is no distinctive difference between a market and porch sunshade. You can opt for either one based on your preferences and price budget. Overall, you need the kind of sunshade that protects well against the UV rays and winds. Q. 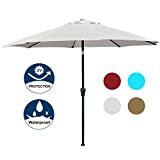 What kind of extra features can I expect from a patio umbrella? A. While considering the shape, size, and build of a porch sunshade is necessary, you might benefit more from your purchase if you consider some special features. You need an extra-durable cover to protect your fabric. This is an incredible accessory for storing your porch sunshade when you’re not around. It also helps in emergency situations when you have to be away from home for a couple of days. It protects the porch sunshade from rust and corrosion, while keeping it away from environmental elements. Many of our top choices include products with built-in lighting. This is another significant accessory for night use. While buying an outdoor fire pit is good for introducing light and warmth into your backyard, it isn’t the best choice for all seasons. That said, lighting can be of great help if you’ve invited guests over for a big game on your outdoor TV! An sunshade net protects you from insects. Many backyards are often used for growing all kinds of plants, which also means it’s a breeding ground for harmless, but noticeable insects. With a safety netting falling on every side of your sunshade, you can relax under it for as long as you want. This is great for anyone looking to spend more hours during nighttime in their garden. A sturdy sunshade base is a must when you do not want table out in your yard. It provides enough footing and support for an upright sunshade. Plus, it keeps the sunshade steady during heavy winds and rains. If you’re choosing a sunshade that’s more than 10-feet in diameter, consider buying a sturdy base. You can contact the product’s manufacturer to check if they sell individual bases. Q. 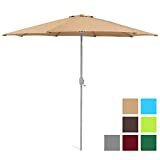 What is the standard opening and closing method for a patio umbrella? A. The last, but also significant aspect of a sunshade is the way is opens and closes. Lots of products come with unique crank and push-button operation. Finding which is the most comfortable technique for you is the real catch. Traditionally, affordable sunshades come with a pulley system which allows you to easily open and close the canopy. And if you want to keep your sunshade open all day and night, considering the right pulley system may not be as vital. But this part of the article answers the question to those who open their umbrellas for only a specific period of time. An inexpensive pulley system is the standard way to open and close a sunshade. It may be hard to handle, at first, but once you get used to it, it’s smooth. You need to put extra pressure on the pulley system to open and close it. It also needs some extra strength for locking the shaft in its place so that it doesn’t fall or topple over. In a pulley system, a simple pin keeps the sunshade securely in its upright position. So you need both hands to balance the sunshade and pin it through the pole for its ideal position. Shopping for the best patio umbrella isn’t easy. But with the help of this article, you should be able to find the best of the best pick faster than before. And in less than no time, you’ll find yourself relaxing under a high-quality and spacious porch sunshade. With everything in place, you won’t find anything better than the Abba Patio 9 Ft Patio Umbrella. At least as far as performance goes! This product exceeds all expectations when it comes to providing water repellant, fade resistant UV protection. Even the steel ribs and aluminum pole offer the best combination and are well equipped to provide strong support. Moreover, the push button is in charge of tilting while the crank system makes opening/closing easier. And for windy climates, the vented canopy prevents inversion. There’s nothing more you could’ve asked for! I’d like to wrap up this article by saying that a porch sunshade works the best for sunny summer months. Once you pick your most favorite color, shape, and size, choosing a good product gets much simpler. And if you do a bit of research beforehand, you’ll find that understand about the varied types, frame materials, shapes, and tilting options of a product really got you making the best decision. Pair this with a good outdoor speaker system and you’ve got yourself a good deal. And that’s what we’re here for!